All that floats across the mind's eyes are visions of clouds floating by against a background of blue skies. In the rural areas the eyes end up being presented with mile long vistas of white and yellow flowered mustard fields. The Bangla month of sharath is an amazing time when nature greets us in all its multi hued splendour. This ethereal season not only pervades through the sleepy expanses of the villages but also into all the nooks and crannies of the busy city life. And all this is made even more surreal with the oncoming Durga puja festivals. The homes of the Bengali Hindus becoming abuzz with activity in preparation for this auspicious occasion. In a sense it's a very simple occasion where one of the most respected deities is being borne into this mortal world through joyous celebration. 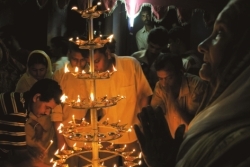 It takes place in three days in which they pay a special homage by bringing in the deity as a bride into their homes. According to legend the bride Durga is supposed to have a homecoming followed by her children Kaartik, Lakshmi, Sharaswati and Ganesh. This starts from the first sighting of the new moon. People give form to their beliefs in ways that are closer related to their earthy selves. The deities especially Durga are no such exception. Those who work so hard to create such a diligent representation of the human belief, do so from the knowledge they have gleamed through centuries of study. In our country the statues that are created always contain seven figures. The limelight is taken by Durga herself who is flanked by Kaartik, Lakshmi, Sharaswati and Ganesh. Her right foot rests on a lion's back while the toe of the left foot is curled around the neck of the devil. There's an interesting fact behind the creation of the statues which requires special preparations. We know that Durga puja starts at the end of aashwin but the preparations begin much earlier. It begins exactly four months in advance in the aashar month during something called the raath uthsaav. That is when they begin creating the statues using the traditional materials of bamboo, straw, flowers, fruits, clay and lots of enamel paint. The artists and craftsmen set down to work as they begin their creations based on the different orders they receive. They begin with creating a basic framework using bamboo and jute twine. Then they use straw to attach the necessary fittings over which they use the special mixture of clay to form the basic raw shapes. Another layer of a different type is applied a few days later. All this is kept inside the house or stage where the statues will be displayed. All the drying takes place at normal room temperature without the need for any artificial heating. The final stage is that of intricately applying the layers of paint to create the ultimate dazzle. The artwork follows previous rituals where the different parts are painted in set colours. For example the statue of Durga is given a light pink hue for her skin while Kaartik and Lakshmi are yellow and Sharaswati and Ganesh are white. The goddess is dressed in real benarasi sari with jewellery made of bamboo strips. Sometimes people even use actual jewellery items. Shankar Dhor is one such artist who transforms a basic mud sculpture into a true likeness of a goddess fit for worship. He takes immense pride in detailing the doe eyed look and the sweet but mysterious smile of the deity. It is a trade that he has been involved in for the last 45 years. He decided to try his hand at this when he used to see such artwork being done as a child. He managed to excel even though he had no formal training in the arts. In time his hobby became his profession. He receives many orders for the different districts. One of his creations has even been taken as far as France. Despite all this he prefers to charge minimal amounts mainly to pay for the labour of his employees. 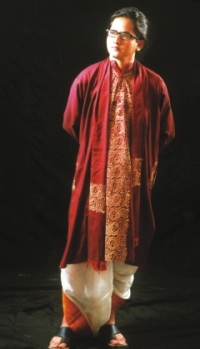 Shankar Dhor tells of how this profession has changed in time. The clay needed for this purpose was readily available near river banks. There were labourers who would gladly bring him his supplies so that such a statue could be created. But these days it is difficult to find either good quality clay or the human help despite paying large sums of money. The problem with poor quality dirt is that it might contain stones or pebbles that might cause cracks in the finished product. Good clay is usually available in the mid river which is later filtered and cleaned to remove impurities. Also bamboo was extensively used before but now people prefer wood. As for the painting, previously coloured powder was mixed and applied over the statues which were then coated with varnish to ensure longevity. Nowadays readily available and easily applicable enamel paint is used to create a dazzling finish. The ten arms of the goddess were given real weapons of choice to be held up in pride. These days it has given way to imitations made of tin. Another change that has taken place is among the worshippers themselves. Whereas, before people used to perform big celebrations at their own homes now such occurrences are few. Political conditions as well as financial squeezes put the squeeze on such displays of worship. Also the families separate into smaller families that end up keeping everything to a little low profile. This festival doesn't only affect and touch the Hindus. Others of different faiths also follow the herd to enjoy the spectacular functions of these four special days. During the Durga puja, mandaps in the news usually are the ones at the old part of Dhaka especially Dhakeshwari Mondir and Ramkrishna Mission. 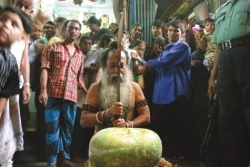 If you wish to join the Sharadiya bliss, places to visit in Dhaka would be Taati bazaar, Laxmi bazaar, Shakhari bazaar, Shutrapur and Rayer bazaar where most of the pujas takes place. These places have hundreds of puja mandaps. Just enter the locality and ask for the location of puja mandaps. Resident students of Jagannath Hall, Dhaka University also arrange a mandap for themselves. If you wish to avoid the crowd then your place would be Jagannath Hall. Outside Dhaka, Naryanganj has huge puja festivity. The narrow road with hundreds of shankha, bindi and jewellery shops led us to House no 25 at Shakhari bazaar. Apart from waiting long hours in the traffic jam at Johnson Road and Bangshal Road, we did not have any difficulty finding the place because on the way we received clear direction from the shopkeepers. It seemed anyone who lives in the locality or comes here often is familiar with the house known as the 'Durga bari'. The modest façade hides a house with an extraordinary story to tell. The house gets it's name and fame from the Durga puja it has hosted for years. The Durga puja arranged by this household is known to be the oldest in the locality. The head of the family, Shamapika Dhar was busy in the kitchen preparing Payesh as guests would be arriving soon. It was the day after Mahalaya, the arrival of the devi. Puja festivities had begun in the morning with Ghot puja. Although the practice these days is to begin puja on the day of Panchami but this family starts at an earlier stage. It's the family tradition says Shamapika Dhar. 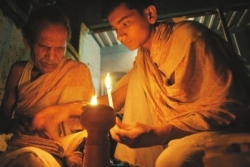 Shamapika Dhar, who was in her 60's could not give us the exact dates but she remembered from the stories she had heard in her childhood that around 150 years ago, her grandfather's uncle Purna Chandra Shur first started worshipping Durga in their house. Shur, who was in the Shankha business had it all except one thing. He was living an unhappy life without any children. One day he prayed to Devi Kaali (another appearance of Durga) that if he had children he would set up a mandap in his house and offer his veneration to the goddess every year. His dreams came true next year. He was blessed with a child. He kept his pledge and started worshipping Durga. The puja has been going on since. The only year they failed to set up the mandap was in the year 1971 during the war of independence. The family still in the Shankha business have their own private craftsmen to prepare the idol of the goddess. And it's the only family in the entire locality who offers sacrifice to the goddess; however, instead of animals they sacrifice pumpkins. Shamapika Dhar and her family have always been the followers of Krishna. She explains, devotees of Krishna do not sacrifice animals or offer blood instead they offer pumpkins to the goddess. 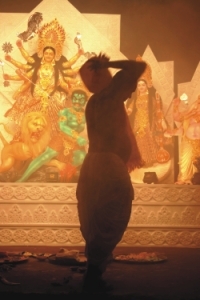 After all these years, Durga puja in the Durga bari is the most popular still. Although there are 8 other pujas in the locality, every year the entire neighbourhood joins the festive mood of Durga bari and worship the goddess.